Martin Hernandez came in the office today. I think he probably makes several people feel better about the world every day of his life. He just has that wonderful attitude. He made mine, I know. And if his daughter, Haven, knew the kind and sweet things he was saying about her, he would make her day too. There isn’t much better than parents who really care for and love their children, is there? I’ve heard Shawn Hanson, CEO of PTCI, give several programs recently. The person who really cares for and wants the best for the company they work for or own is another excellent thing to treasure. Shawn wanted no introduction before the programs because he seemed to consider the information in the program of importance, not who he is, what he’s done, and all that fluff. The program was interesting and Shawn was humble and smart the whole time. I don’t know diddley squat about cell phones (can’t even figure out how to unlock an old text), but I enjoyed the program. And I’ve heard how his employees speak so highly of him. There isn’t much better than a boss who really cares and loves their business and employees, is there? Recently there has been a little drama in my life. I hate drama. I dislike being around people who have or cause drama. I’ve been that person a bit lately and I have to say I still have friends who will come and see me, listen and cheer me up. There isn’t much better than a friend who really cares and loves their friend even when the friend is being a bit of trouble, is there? In the past week I visited two new Main Street Guymon members. Maria Vega at Nuestra Trienna, north of the 4th Street and Hwy 54 intersection. I call it the old Saratoga building. Dates me, doesn’t it? That is a wonderful market! Everything is so nice and clean. Great meat market and fresh veggies and fruits. The best part are the murals being painted inside. Loved them. So if you’re needing groceries, you can try there. The other business is La Victoria’s, which is on the south side of the same intersection. Victoria’s is a small market and they also have meat for sale and all sorts of things. They are really friendly. Take a drive down and visit these stores. 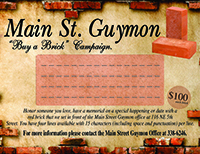 Tell them how glad we are that we have new businesses in Guymon!